After hearing some reasonably positive things about the Second Annual Toronto Garlic Festival at the Evergreen Brick Works on Saturday, I decided to take the pungent plunge to check out the event on Sunday, hoping to indulge in @BabiAndCo’s garlicky Indonesian Street Food that had everybody raving on the twitterverse on Saturday. The event organizers had free shuttle buses running between Broadview Stations and the Evergreen Brick Works every 10 minutes (as opposed to the usual 30 minutes). Short 7 minute busride later, we arrive at the Evergreen Brick Works. 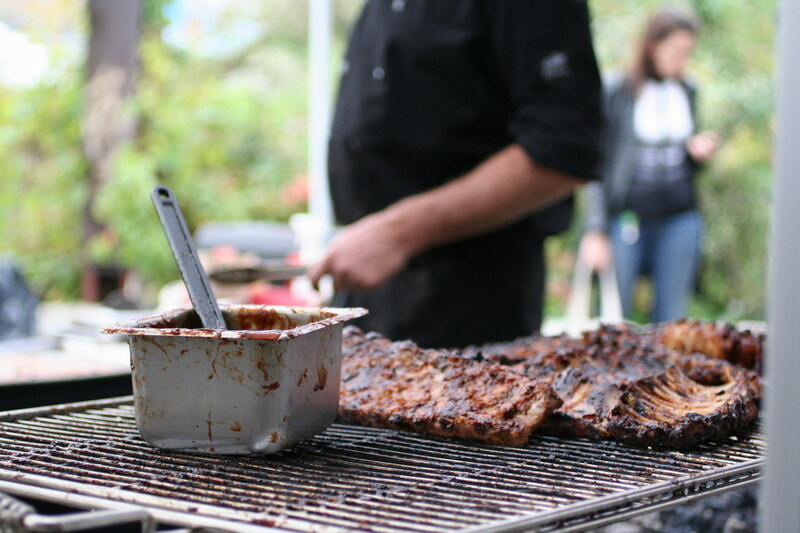 Admission to the event was $10, with food offerings separate and a la carte. Walking in to the venue, while there was garlic everywhere, I can’t say that I really smelled a lot of garlic in the air. Shocking, I know. There were maybe only one or two vendors cooking/sauteeing garlic. I was definitely hoping for vendors to roast whole garlics and provide sample cloves to taste. 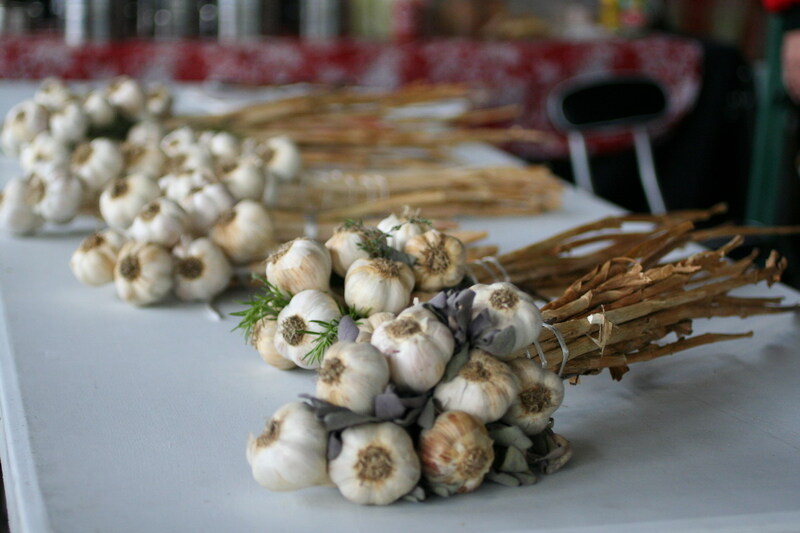 Bunches upon bunches of fresh harvested Ontario garlic. 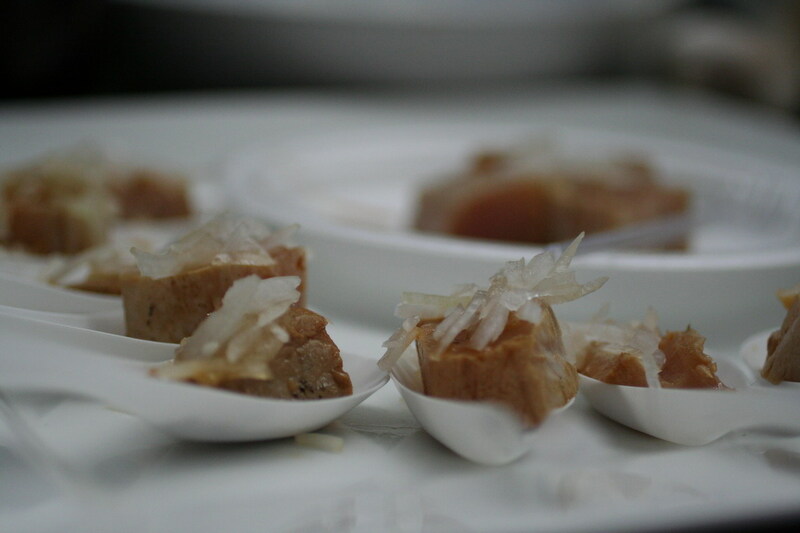 The number of varieties was overwhelming, and really difficult to gauge & understand without being able to taste them. The vendors tried their best to help attendees navigate the different varieties. Garlic all strung up — the ultimate in vampire defense. 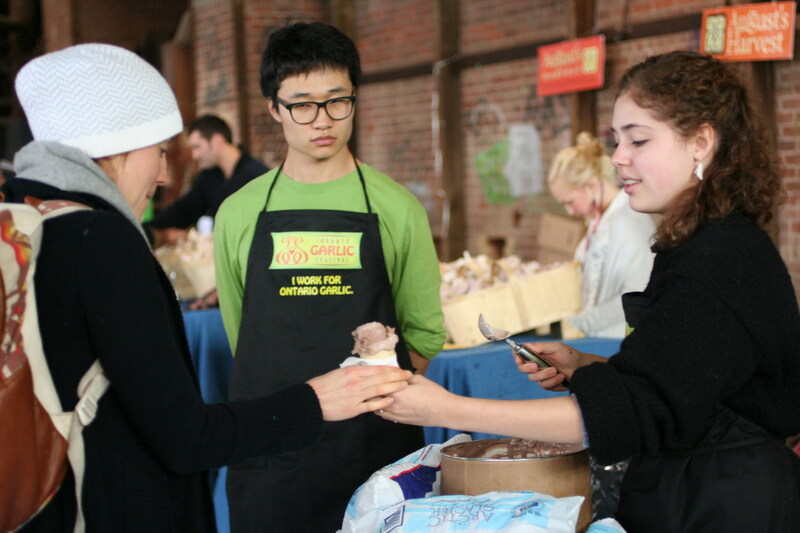 Chocolate Garlic Ice Cream ($2) was an interesting experience, as the first item I tried at the event. Near the end of the day, the ice cream was starting to get messy, but still held its shape for 2-3 minutes in the cone. The first bite hits you with that mellow, deep, sweet roasted garlic flavour, slowly giving way to the chocolate flavour. 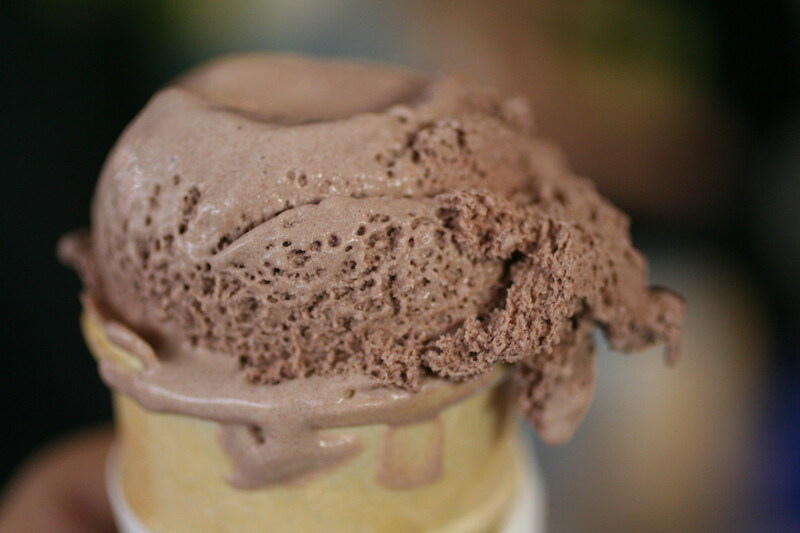 By the time you’re halfway through the ice cream, the chocolate is far too overpowering, with no taste of garlic at all. Definitely an interesting pairing, and opened up ideas for pairing the two. The Spice Chef’s table featured Salted Caramel Roasted Garlic Truffle ($2). Much like the chocolate ice cream, the initial flavour is sweet roasted garlic, slowly morphing into a brulee caramel and rich chocolate. 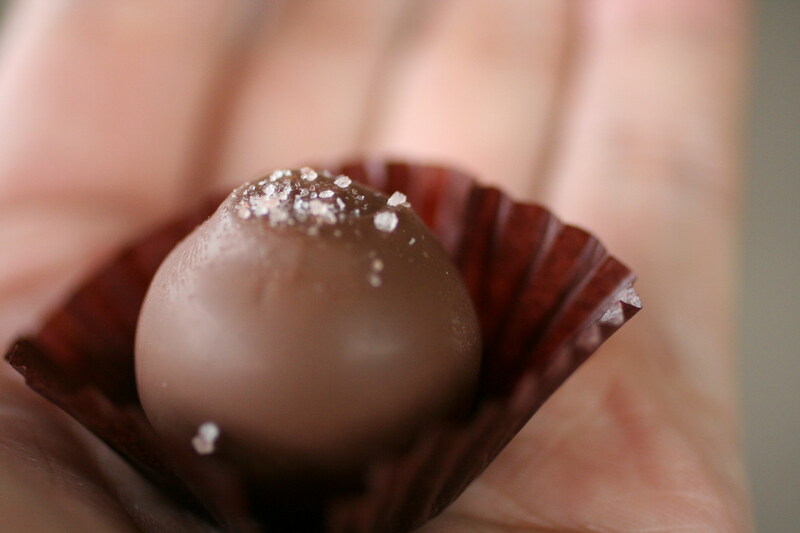 The glossy firm exterior gave way to a soft roasted garlic and caramel center. The caramel wasn’t too sweet, but had enough burnt flavour. 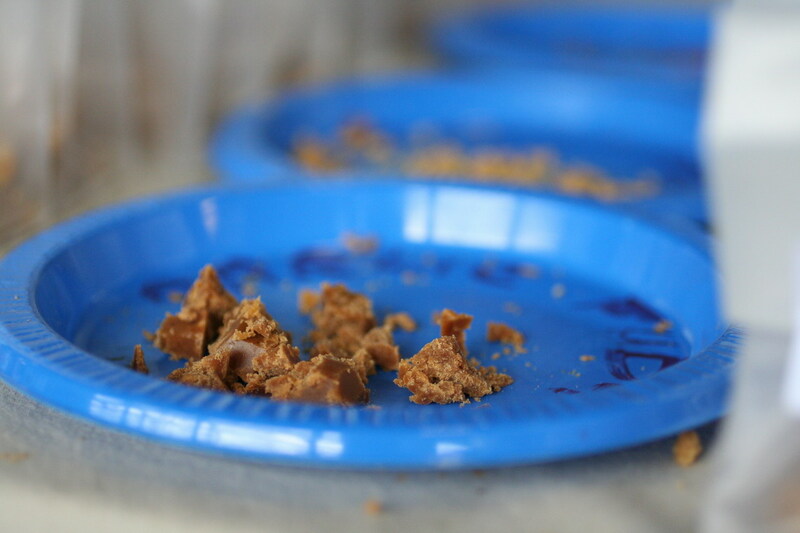 The garlic was strong enough to stand up to both the chocolate and the caramel, while the sea salt paired wonderfully with both the chocolate and the caramel. 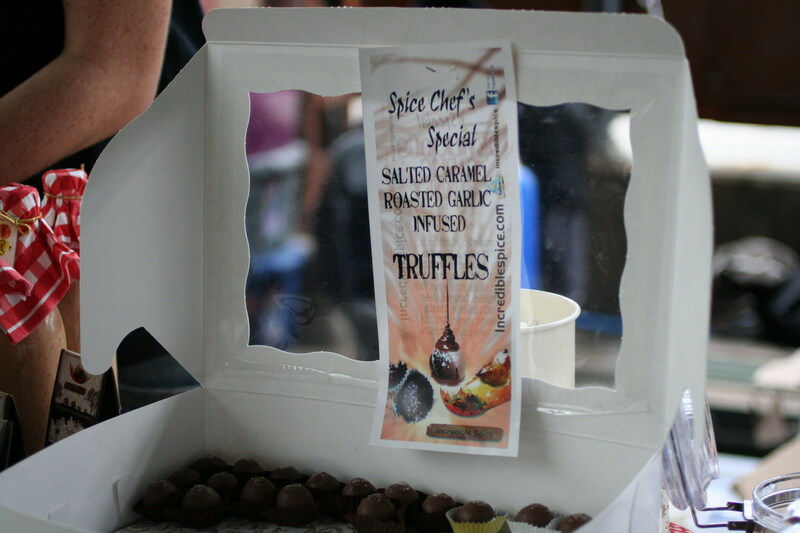 A lady came by near the end of the event, and bought up the remainder of the box ~ some 40-odd truffles. “Tosa-style” BC Tuna ($2) from chef Sang Kim. I’m guessing that the topping were onion shavings, but couldn’t really discern them due to their mildness. They were also offering salmon in the same manner. I think some crunchy fried minced garlic or garlic slivers would have been perfect, given the venue. Buzy Liz’s Farm Shop (http://www.busylizs.com) offered up samples of Garlic Fudge and Garlic Brittle! 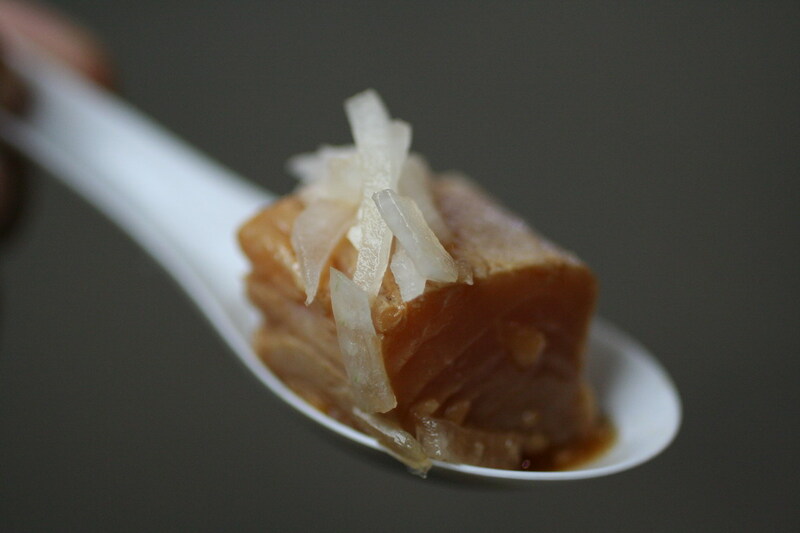 It was like eating soft sweeted roasted garlic, with a hint of butteriness and sweetness. I ended up picking up small bags of both. 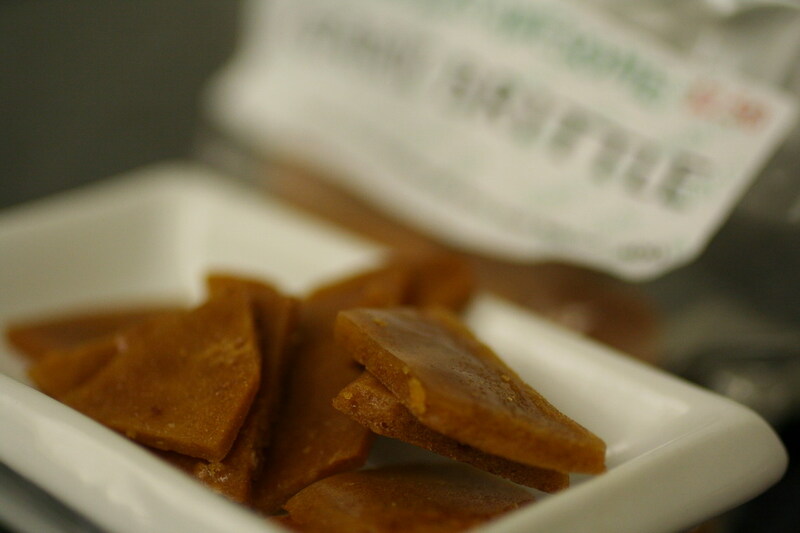 Busy Liz’s Awesome Garlic Brittle ($2.50)– hard buttery caramel brittle with strong notes of roasted garlic, with little bits of nuts. Great for snacking and you’re not sure if you want sweet or savory. 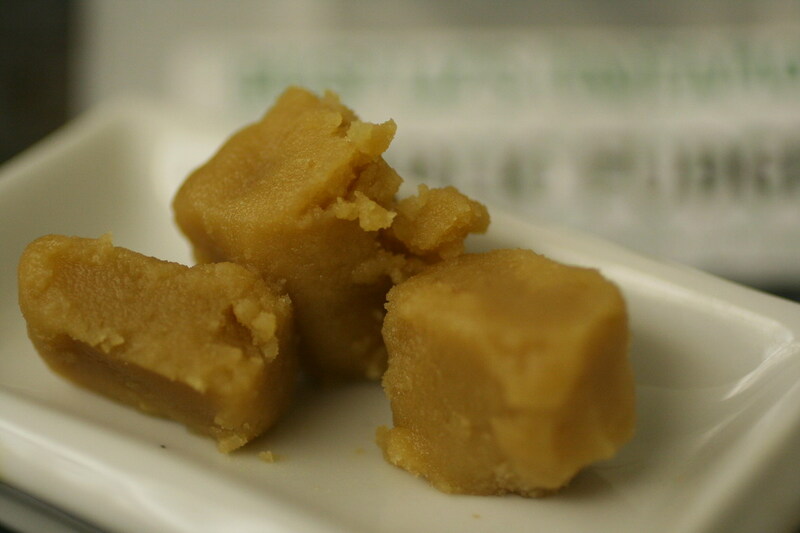 Busy Liz’s (In)Famous Garlic Fudge ($3) — not very chocolatey, but great roasted garlic flavour and butteriness. It was a bit soft at room temperature, but putting it in the fridge also mutes the garlic flavour. 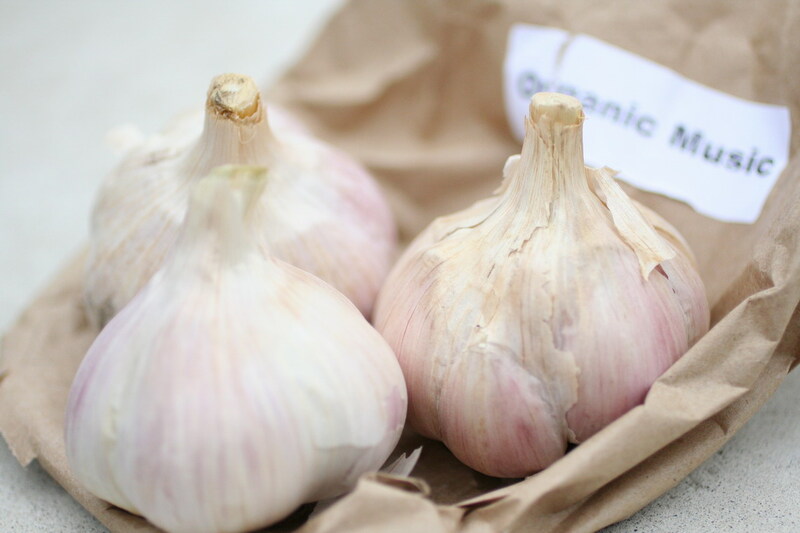 Warren Ham of August’s Harvest helped me pick up some garlic for roasting, from both ends of the hardnecked garlic sweet-to-spicy spectrum. Garlics are apparently best if they’re nice and firm, and you shouldn’t have to worry about them getting dry if it’s still within harvest season. Organic Music Garlic (3 for $5), supposed to have high sugar content and very little spice, making for great caramelization. 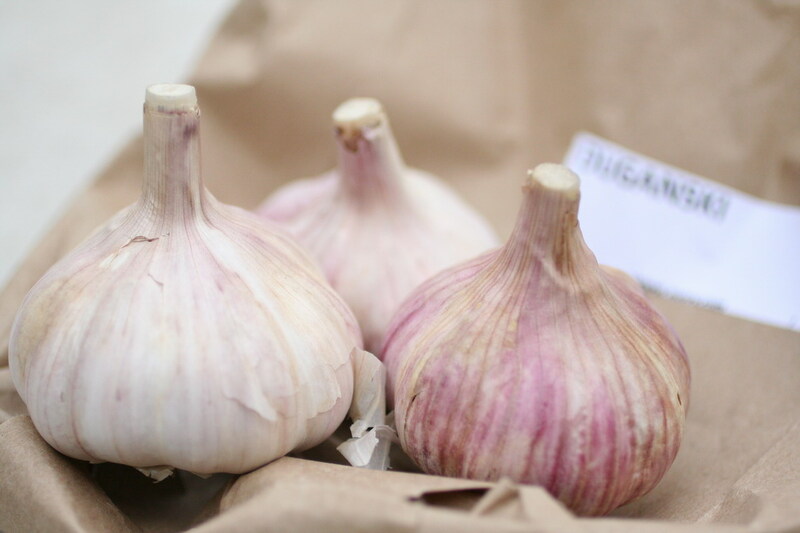 Duganski Garlic (3 for $5), much spicier with less sugar, should make for great flavour. 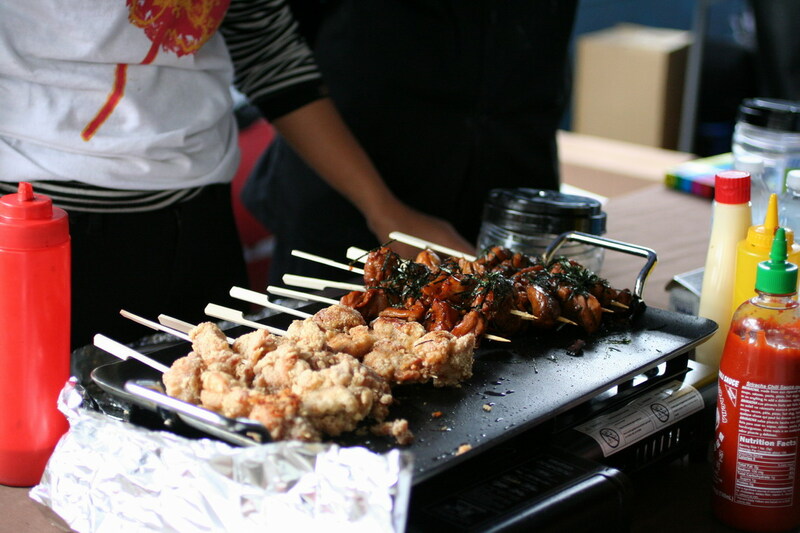 Gushi was offering chicken karaage skewers and chicken teriyaki skewers. Didn’t see anything particularly “garlicky” about their product, esp not at $4/$6? (I forget the price). Didn’t try this either, but it looked too pretty not to photograph. 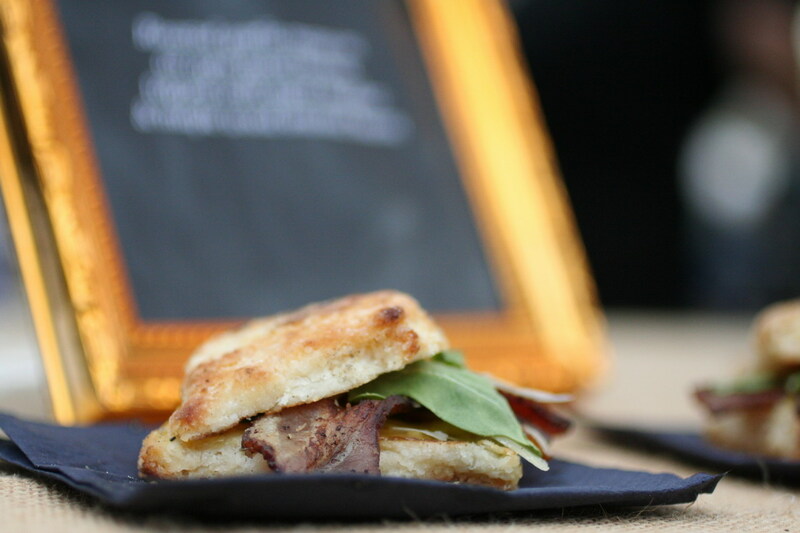 Bacon on a biscuit with roasted garlic mayo — but at $6? Nah. 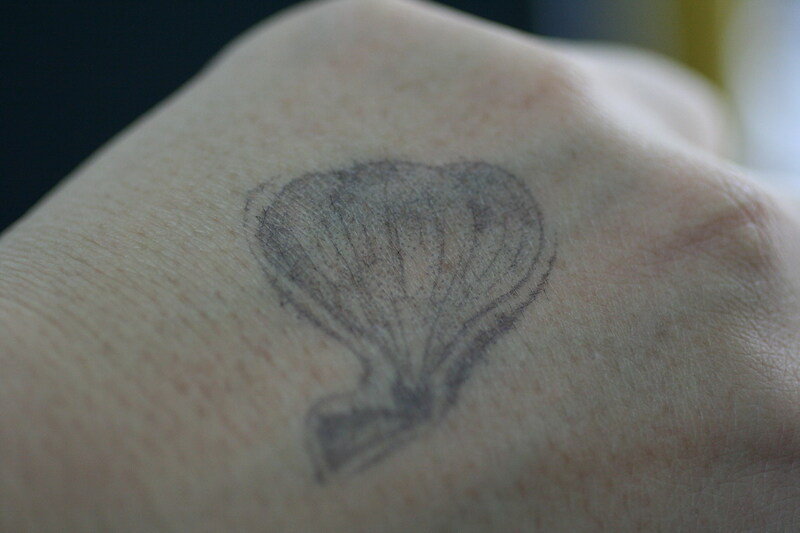 An entrance/admission stamp, but also a warning to TTC patrons that my breath might be deadly. It was also great running into Rebekka(@rubycrumble) of Alchemy Pickle Co. (@AlchemyPickle) who had great spicy garlic preserves! Half-garlic, Half-chilis, all delicious! I think the event was a fun experience, but there’s definitely a lot of room for improvement. The lack of a day-by-day vendor listing and event map made it frustrating to find specific vendors. I understand that there are costs associated with usage of the venue, but it was $16 between admission, an ice cream, a chocolate, and a spoon of tuna. More substantial food would easily have put me over $25. 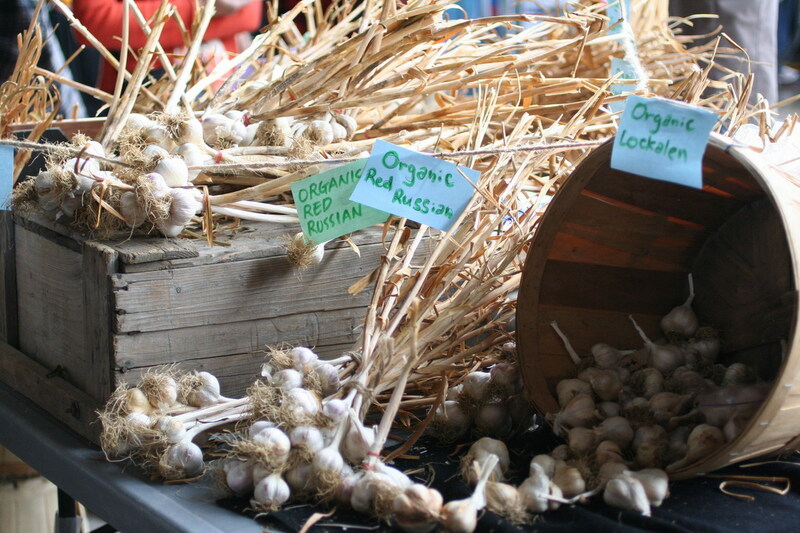 Thanks for your comments about the Toronto Garlic Festival. We’ll be making improvements for the 2013 festival, including a vendor listing. Thats cool. Vancouver should have something this ! I don’t mind a little garlic breath!